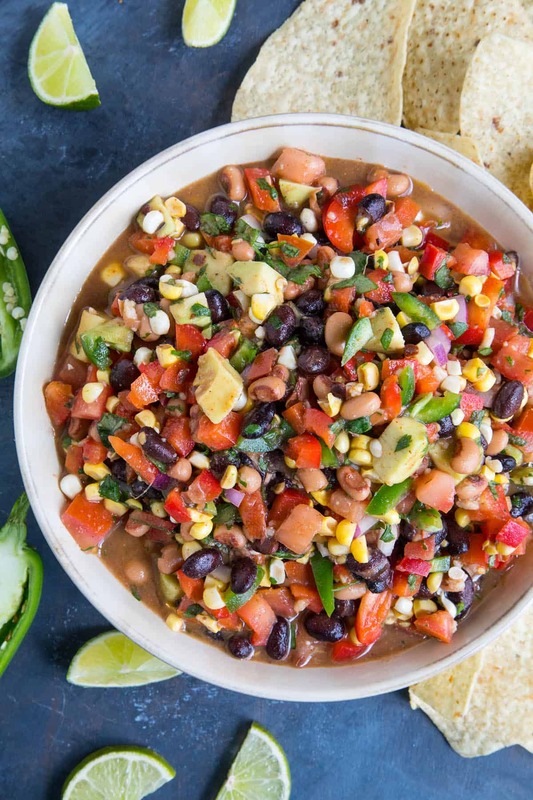 Cowboy Caviar is a vibrant salsa-bean salad combo that is perfect for any party. Made with fresh ingredients, this version kicks it up a notch with extra jalapeno peppers and additional spices that make it better than any I’ve ever had. If you’ve ever had “Cowboy Caviar” before, you’ll know that this stuff is GREAT. AKA “Texas Caviar”, Cowboy Caviar is super flavorful and it’s always a hit at every party. It’s ideal for backyard barbecue situations, as it pairs with basically anything, and it can be served as an appetizer, a side dish, or even a topping for all of your wonderful grilled meats. 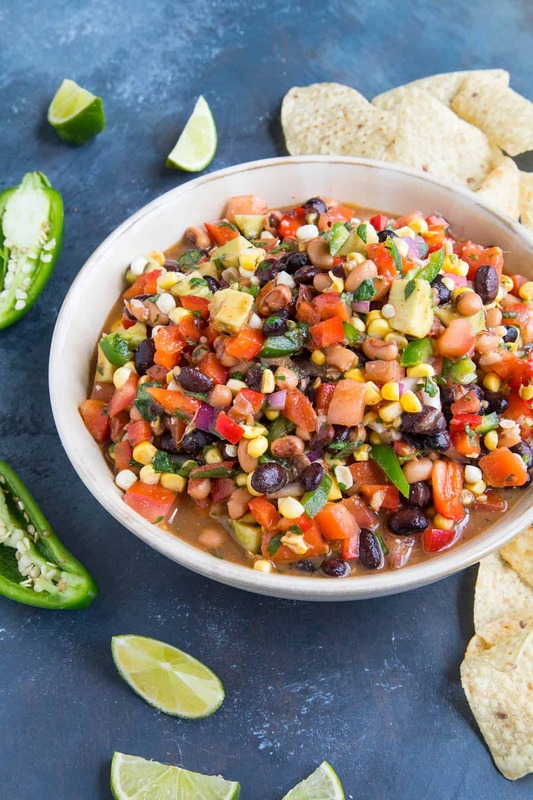 Cowboy Caviar is a combination salsa and salad made with beans, peppers, tomato and avocado, all tossed in a tangy vinaigrette. It’s either a side dish or a salsa or a dip, however you want to serve it. Just don’t forget the chips! 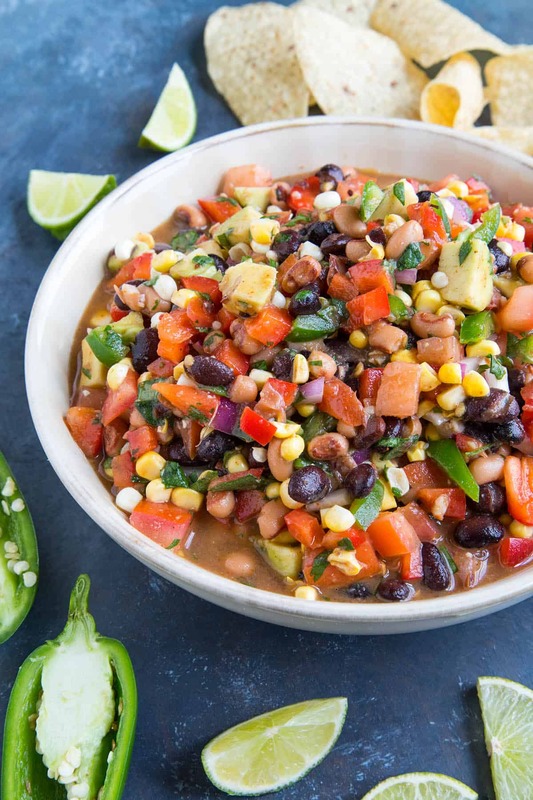 It is made with black beans and black eyed peas, which qualifies it as a bean salad, though the inclusion of fresh vegetables and super flavorful dressing makes it a special thing indeed. I’ve happily enjoyed Cowboy Caviar at many a gathering, and I’ve made it a number of times, but I eventually came upon the proper ratios, ingredients and SPICES that, for me, make this truly the ULTIMATE Cowboy Caviar recipe, and also for me, the best one I’ve ever had! The really awesome thing about it is that it is super easy to whip together, even at last minute or only a moment’s notice. And everyone loves it. Let’s get “cooking”, shall we? There is no actual cooking involved here, mostly just chopping and mixing. So yeah! First, let’s gather up our ingredients. We’re using a lot of different components, including both black beans and black eyed peas, as well as a red bell pepper, a couple jalapeno peppers, fresh corn (very important! ), chopped tomato (roma tomatoes are good), red onion, diced avocado, and fresh chopped cilantro. Toss it all together in a bowl with a fantastic vinaigrette made from olive oil, red wine vinegar, lime juice, and an outstanding collection of seasonings that are discussed below. You can also use Italian dressing in place of the vinaigrette, though I like my version better. That is it! Give the mixture a good coating of your homemade dressing and serve it up with tortilla chips! Why is This Cowboy Caviar the “Ultimate”? 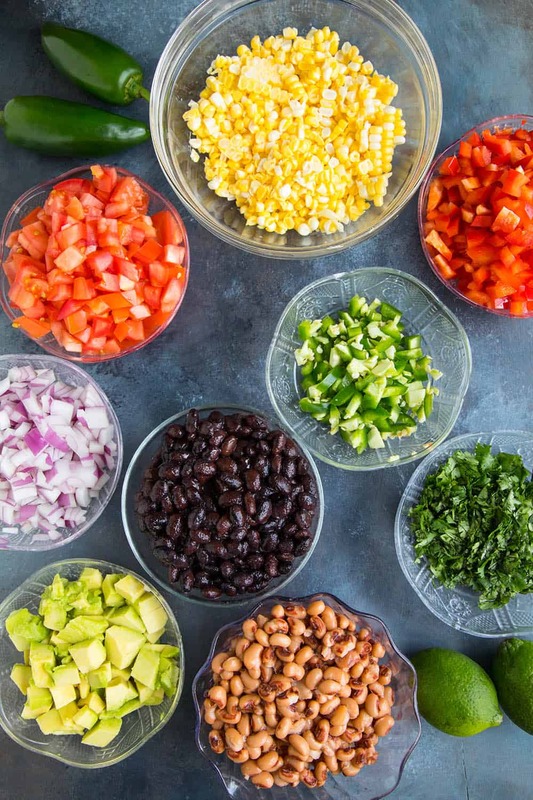 This is the ULTIMATE Cowboy Caviar recipe because of our spice mix as well as the inclusion of avocado, which I feel is quite necessary and very fresh sweet corn. Our spices include some of my very favorites as they bring out and compliment the flavor in such a powerful way, including spicy cayenne, earthy ancho chili powder, cumin, garlic and onion powders, and some spicy chili flakes, which you can increase or decrease to your own personal preferences. Many Cowboy Caviar recipes call for bell pepper only, and some include a jalapeno pepper, but we’re going to go ahead and toss in two, OK? Or maybe three. It’s really up to you, you crazy chilihead. Some recipes I’ve tried call for a lot of sugar, which I find unnecessary. I have included a small pinch of sugar in this recipe, and even that is optional, because the sweet corn is so fresh and, of course, SWEET enough to bring a perfect balance of flavors. And don’t forget the avocado! It’s just SO GOOD with avocado! So yeah, that’s why this is the ULTIMATE. At least for me. Most Cowboy Caviar recipes are made with bell peppers and fewer seasonings. We’re kicking it up a bit with jalapeno peppers and more seasonings, but if you’d really like to up that overall zest factor even further, move up the Scoville Heat Unit Scale and add in a serrano pepper or two. They have a good heat level and they’re easy to find in most grocery stores. A habanero pepper would be quite welcomed as well, which is even spicier. You can also add in more spicy chili flakes and spicy cayenne pepper. If you’d like to dial back on the heat, skip the jalapeno, spicy chili flakes, and either limit or omit the cayenne powder. How Long Will My Cowboy Caviar Last? Cowboy Caviar will last up to a week covered in the refrigerator if you are NOT using avocado, which will brown after a day or so. If you’d like it to last longer, skip the avocado. Cowboy Caviar is better served fresh or at least within the first few hours. Can I Make Cowboy Caviar Ahead? Yes, you can make your Cowboy Caviar ahead of time, but if you’re going to include avocado, add it in at the last moment just before serving. In fact, a good strategy for making Cowboy Caviar ahead of time is to mix all of the ingredients together except for the avocado and the vinaigrette dressing. Add those elements in and stir them up when you are ready to serve and you should be good to go. Cowboy caviar is so fresh and simple. You can throw it together in 15 minutes. Such an easy dip recipe! Get chopping! Perfect as a side dish or dip for parties, barbecues, backyard gatherings or picnics. 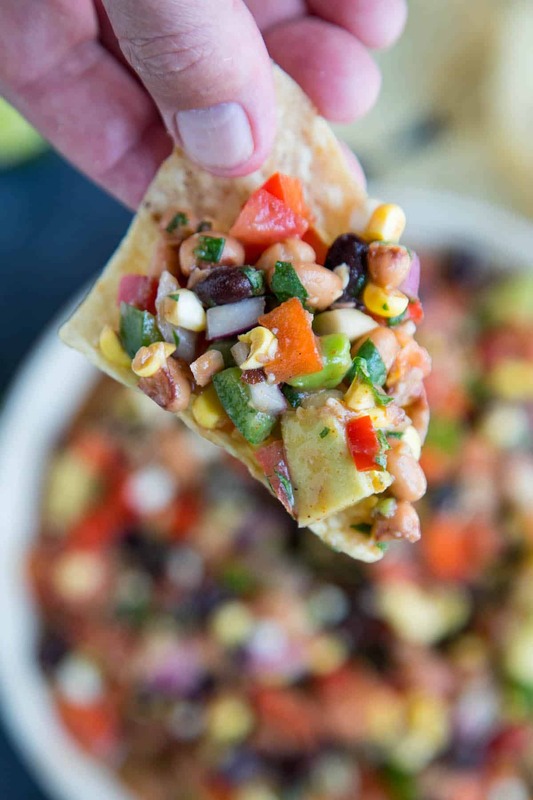 Cowboy Caviar is a vibrant salsa-bean salad combo that is perfect for any party. Made with fresh ingredients, this version kicks it up a notch with extra jalapeno peppers and additional spices that make it better than any I've ever had. Whisk the dressing/vinaigrette ingredients together in a small bowl until they thicken up. Add all of the cowboy caviar ingredients to a large bowl and mix to combine. Stir in the dressing/vinaigrette. Make sure everything gets nice and evenly coated. Adjust for salt and pepper. Serve immediately with chips! My goal here is NOT to make this overly spicy, but to have just the right amount of kick to it for the general spicy food lover. As mentioned, you CAN easily adjust this up for more heat, but the combination of jalapeno peppers, cayenne powder and spicy chili flakes gives this a blooming warmth that I LOVE. And it's freaking tasty as heck, too. Perfect. Cowboy Caviar is gluten free. Just be sure to serve it with gluten free chips.